57 Kez got the name after a joke as one of the members thought Kez meant cat in English. Add on 57 and it looked like a cool name. 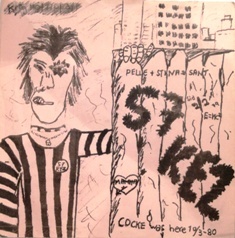 The band, formed in 1979, was from Bromölla in Sweden (outside Sölvesborg) and they were just kids (about 13-14 years old) when then started. The recording is done on a two channel more or less live. The record in my opinion has they charm of a young band and I like the title song Punks best. The band played in the region and was able to play as support act for Ebba Grön. At that time they tossed out their records to the audience. 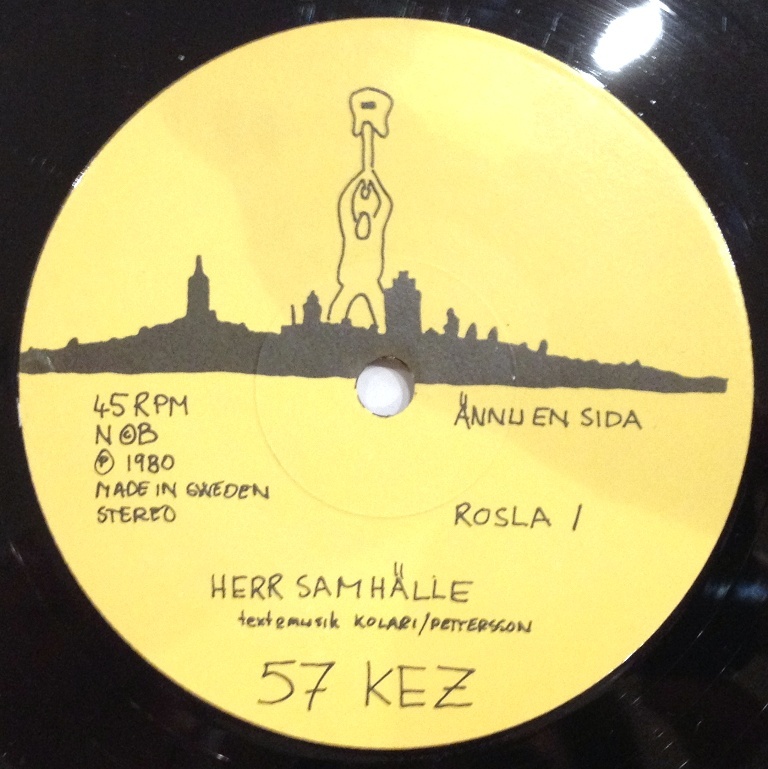 Despite the few number of copies made, 150 to 200, there are two sleeve version. The first version is a slightly oversized glued pocket sleeve. For the second version there are two pieces of thin paper (apparently in two shades of pink). I heard the story that they lost the original artwork and made a new one based on the first sleeve (the glued one). 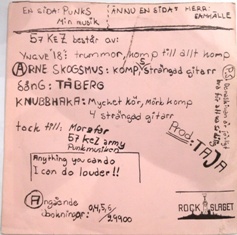 Considering that a lot of records got damanaged this is one of the hardest swedish punk record to find. This release is the glued pocket sleeve. Click on the images to expand them to higher resolution. As usual all images and audio clips is from my record. Depends on how badly you want the record,and if you have the money to buy it. To be honest, I don’t think he wants to sell the records. 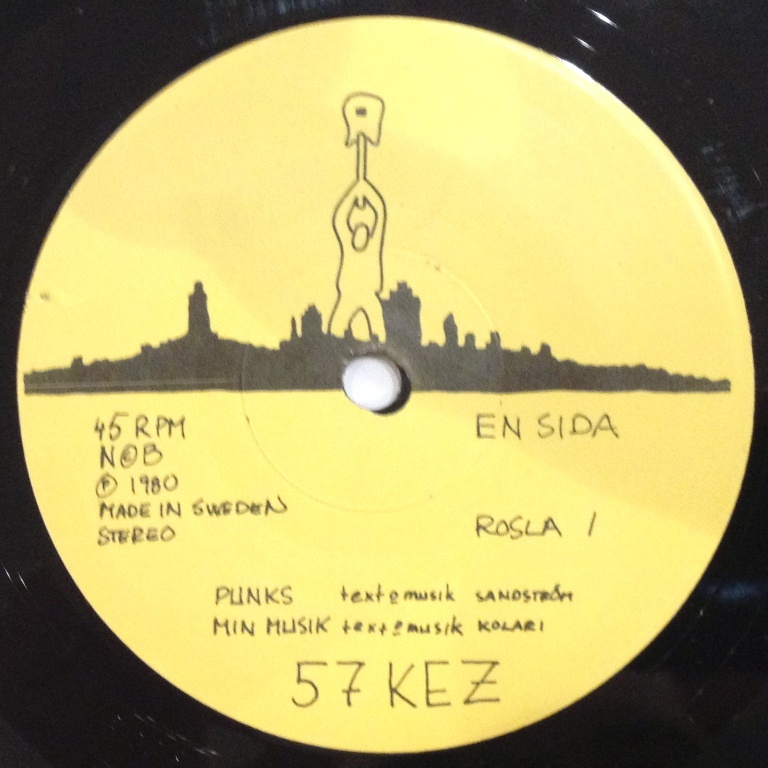 Most stuff is waaay over priced, inc 57 kez (that I don’t even like that much despite being obsessed with Swe punk). On the rare stuff at Near Mint he got sick prices. I see that the stuff get sold but slowly. On the more common stuff he has fair prices. He changed his user name a year ago of some reason. He had 400 sales with 100 % feedback on that user. I didn’t mean to slag him off, just think lot of his records are priced over the top, ie his wife wants him to get rid of it, he says OK, I’ll put it up on Discogs then! And then sets prices that you have to be desperate too accept so he won’t have to sell them. I’ve bought something from him as well, and he’s great. An ex copy was sold for 1250 dollars the other day. I have only seen two copies for sale the last two years.One copy on tradera that was sold for +2000 Swedish Crowns,(writing on cover)And one unplayed copy on Blocket for 1500 Swedish Crowns.I called the seller about 3 hours after it went for sale,but it was already sold.He was the first owner and got it when they played.in karlshamn.It was the glued sleeve version. 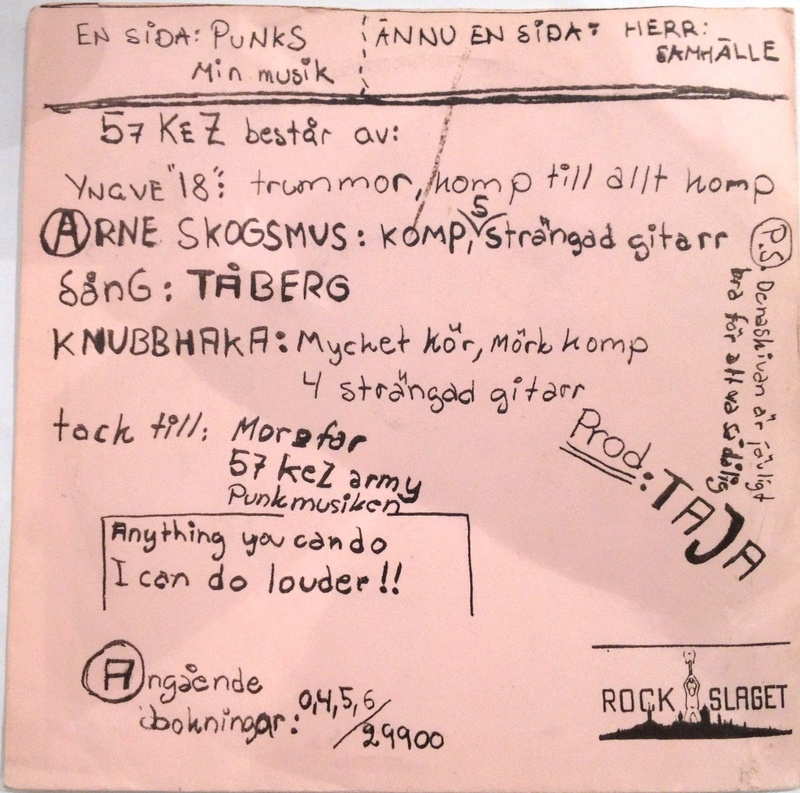 The band was from Bromölla, I was in contact with the guitar player Harri Kolari in the 80’s, because after the band call it a day he was in SVEA SVIN from 1981 on, who put out a few excellent demos and are on one or two compilations, but failed to produce a record by their own. 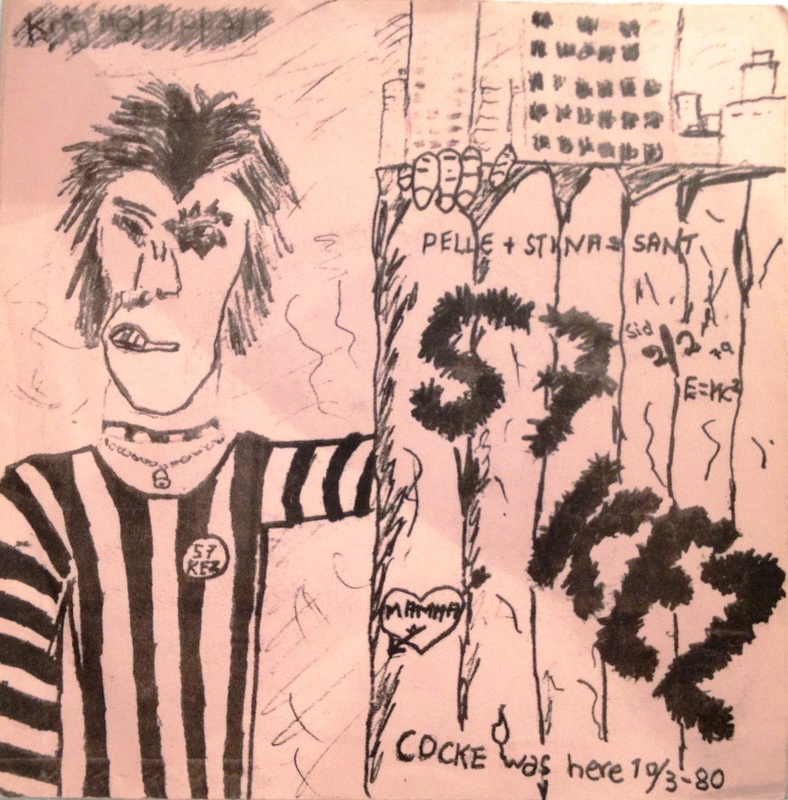 SVEA SVIN split up around 1983 or 1984, but he continues to play in a band called TRE ONDA MAN, who puts out a self produced tape and is on several tape compilations, too. Was it on ebay that this record went for 1250 dollar?Couldnt find anything about any auction on either popsike or discogs. A lot of these rare items seems to sell outside auctions site. The price you mentioned was between two collectors…. What is he saying in PUNKS? english translation anyone? I got this record. I bought it in Karlshamn on rockslaget. The record os on good shape. Price? If someone like to buy it send an e mail. Markku, I am interested in buying your copy of 57KEZ.